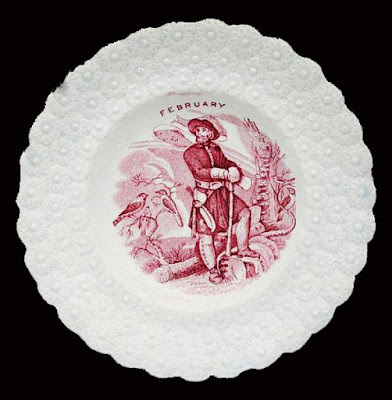 Josiah Wedgwood (1759-2005) "February." The pattern was designed by Helen Miles for a series of tiles that were later used as the center of plates with various borders, ca, 1880. The border is known as "Mikado." 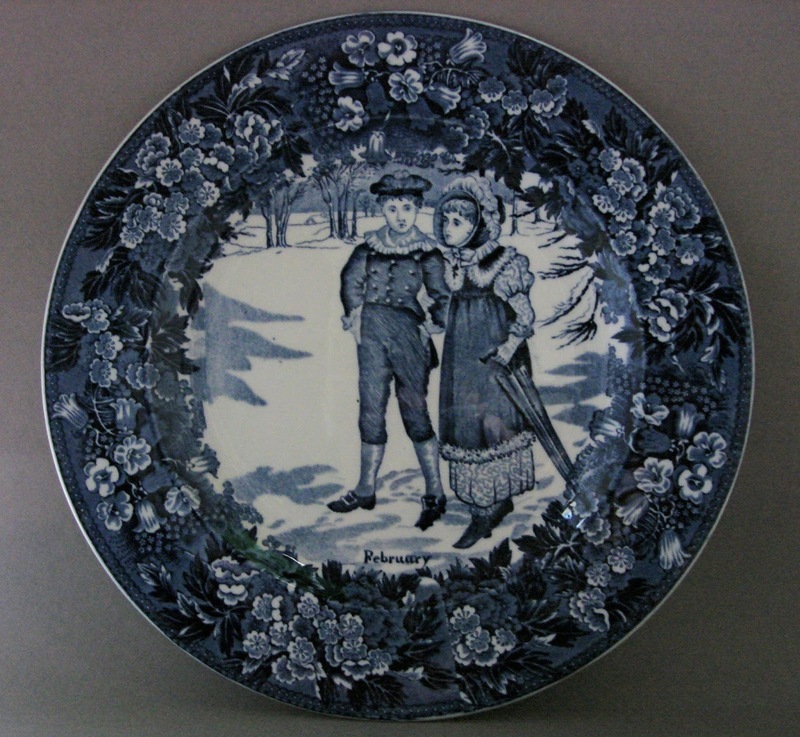 The border was used by Wedgwood for a series of Japanese inspired tiles. And this series. February is birthday month in my family: two of my sons and my granddaughter. We celebrate Jonas' birthday on the 8th, Maya's on the 15th, and David's on the 21st. We eat a lot of cake. I thought this would be a good time to show you a few February transferware patterns. 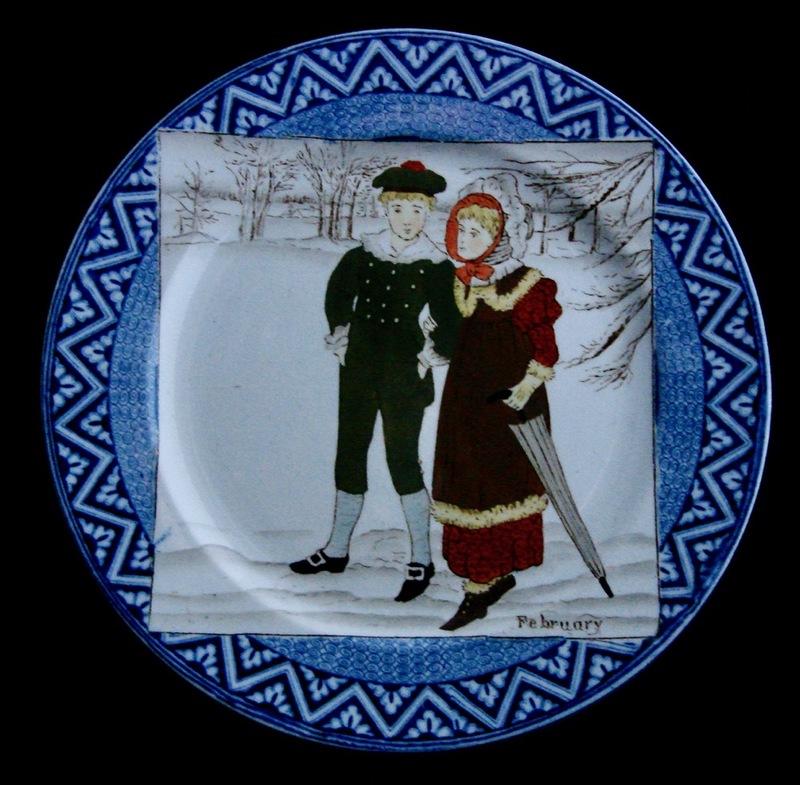 Here is a later rendition of the Wedgwood pattern seen above. Notice that the "tile" has disappeared from the center. Obviously, a different border was used too. 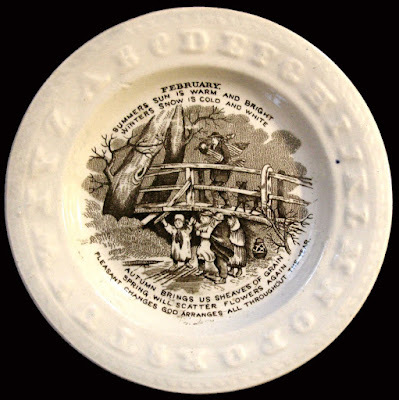 This 6.62 inch plate with a molded alphabet border is part of a series of months. 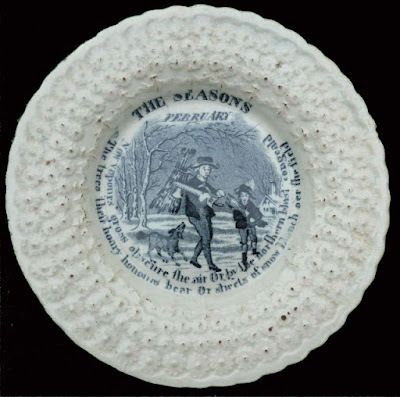 Although each month is printed on the plate and has a scene to match the month, every pattern has the same poem: "Summers (sic) Sun Is Warm And Bright/Winters (sic) Snow Is Cold And White/Autumn Brings Us Sheaves Of Grain/Spring Will Scatter Flowers Again/Pleasant Changes God Arranges All Throughout The Year." 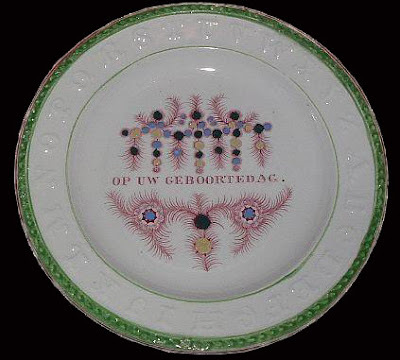 Beech, Hancock & Co. (1851-1855) 6.5 inch plate with a molded daisy border. It is part of "The Seasons" series. Each plate features a scene that represents the month of the year plus a poem. Here the words are; "Now vapours gross obscure the air/Or by the northern blast congealed/The trees their hoary honours bear/Or sheets of snow blanch oer (sic) the field." To me this is pure doggerel! Scott (1800-1897) 6.5 inch child's plate with a molded daisy border. If you look carefully behind the man's left shoulder and to the right of his head, you will see the two fish that represent the Pisces astrological sign. The February birthdays need cake. 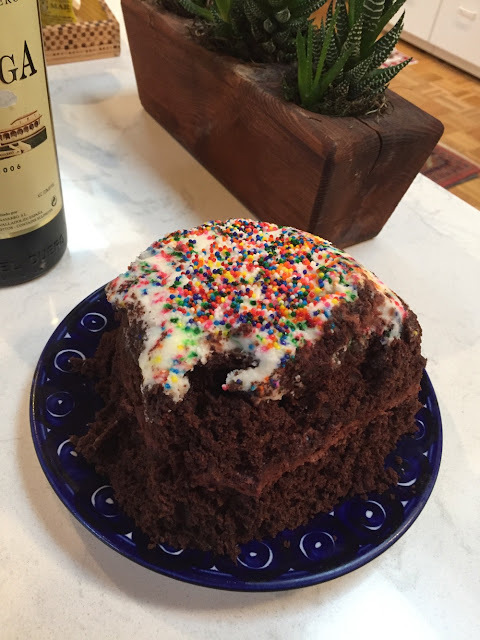 I meant to take a photo of the chocolate cake with vanilla buttercream frosting and chocolate buttercream filling that took me more than two hours to make, but I forgot! Here is what's left. I made it for Jonas' birthday dinner. Here is what's left of Jonas' birthday cake. People liked the frosting best. One more thing. 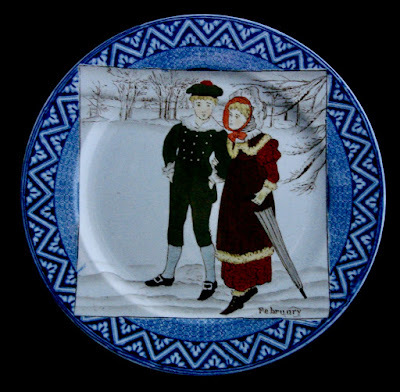 Is there a "Happy Birthday" transferware plate? Yes. William Hackwood (1827-1843) 7 inch child's plate made for the Dutch market. The words, translated from the Dutch, mean "Happy Day of your Birth or Happy Birthday." What a lovely gift for a child's birthday. We also have family birthdays in March (two), May, June (four), July, August, September, November (two), December, and January. This was lots of fun. Thank you. I'll look to see if March is posted. My birthday is March 2, but more importantly my grandnephew was this month born March 2. Ha! Glad you liked February. I shall write a post about March. Both my sister and my sixth grandson celebrate March birthdays: Janet on the 30th and Joey on the 12th. Happy birthday to you and your grandnephew!